One of the features of Windows 10 that almost everyone likes, and almost everyone can use, is called Virtual Desktops. 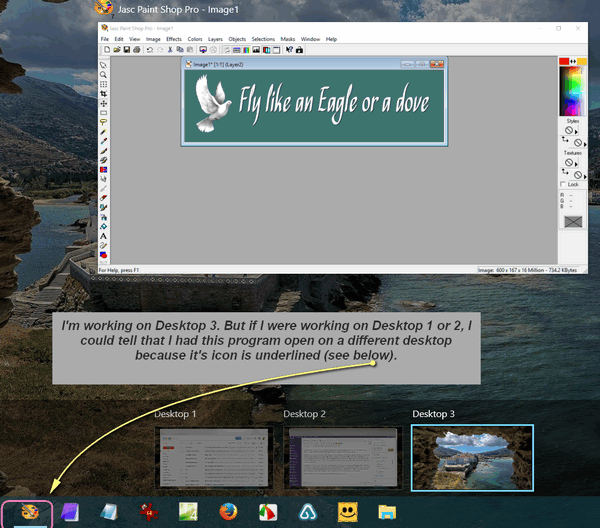 You can switch between desktops just by clicking a taskbar icon and clicking on any one of the Virtual desktop you have created. Well, let’s say you have a document you’re working on and you decide you want to open a graphics editor to work on some graphics. Well you could open a graphics editor on the same desktop – and you can split the screen with your document on one side (or top) and one on the other side (or bottom) and this is OK, because it works. But lets say you also want to check your email and pay some bills online too. Now you’re talking clutter and if you’re old and feeble like us we’re talking forgetting all the stuff we have open. So Windows 10 allows you to create multiple desktops and switch between them simply by clicking an icon. 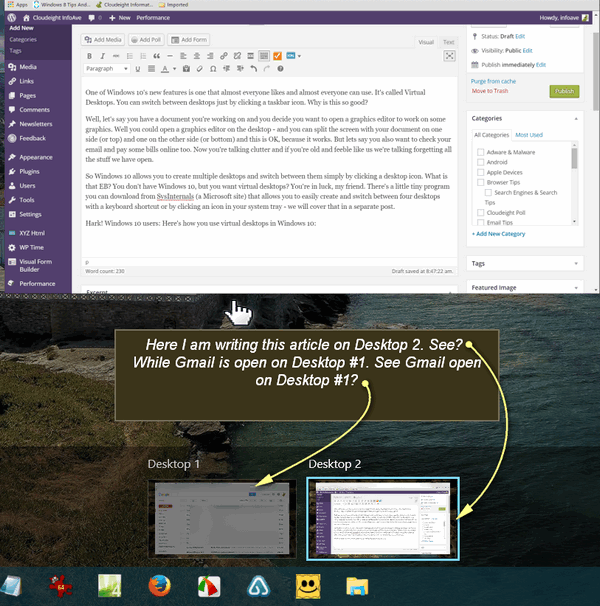 I have this article open in Desktop 2 and Gmail open in Desktop 1. See? But I want to make a new graphic and I don’t want it open in the same desktop with Gmail or on the desktop where I’m working on this article (InfoAve Website). I open the graphics editor in this window, but I want to move it to a new desktop, so I click the Task view/Virtual desktops icon. 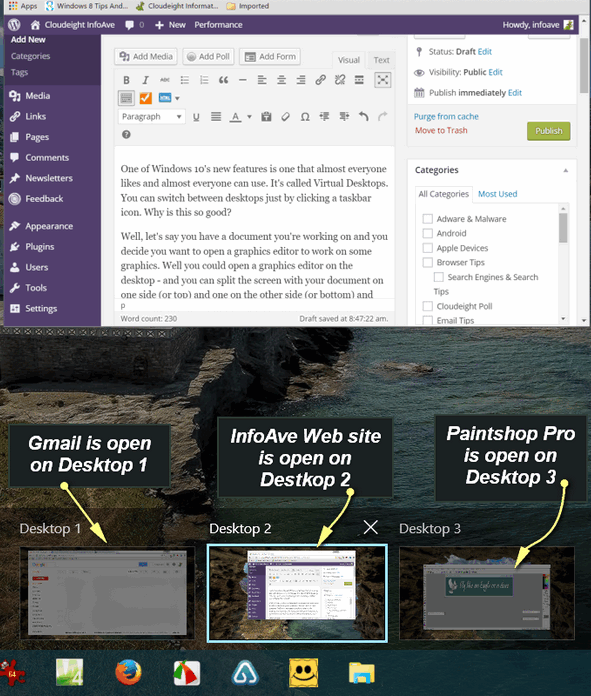 Now I have 3 desktops – Gmail is open in Desktop 1, the Web editor for InfoAve Website is open on Desktop 2, and PaintShop is open on Desktop 3 (the active desktop). See? Here’s what it looks like with 3 programs running on 3 separate desktops. I get this view by clicking the Virtual desktop / Task view icon. Clicking on one of the desktops brings it into focus . The other two desktops are available any time you want to switch to them. 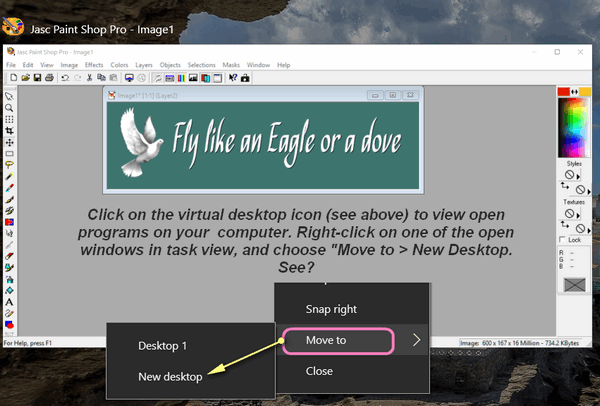 Just click the Virtual desktop / Task view icon and click on the desktop you want to work on. See? You can have as many virtual desktops as you like, but don’t get too crazy! You can switch between your virtual desktops by clicking on the Virtual desktop / Task view icon and clicking on the desktop you want to work with. You can also access Taskview and Virtual desktop by pressing Windows Key + Tab. TC, I must be losing it. Where is the link to the Virtual Desktop? You usually post a link in italics for everyone to follow to a download. I went to the site you mentioned but I couldn’t find the tiny little program to download. Could you clarify your statement a bit more? Task View and Virtual Desktop are Windows 10 features. There is nothing to download. The phrase in italics is for Windows 8x and Windows 7 users who want to use something similar (but not the same) to Virtual Desktops. As I noted in the article we will cover virtual desktop clone for Windows 7 / Windows 8.x users at a later time. You have Windows 10 – so you don’t download anything. You already have it. In case someone still cannot access virtual desktops on Windows 10, press win+tab and that is about it. I landed on this page while looking for a way to restore my virtual desktops after an accidental reboot and whether I can make some permanent assignments for apps and desktops. Haven’t found anything thus far. Thanks I’ve added Windows Key + Tab to the article – it brings up both Taskview and any virtual desktops that have been created.